The roads were still closed, but if I took some secondary roads that only had warnings ("road flooded, single lane traffic, flagperson present...") I could make it to Melville. 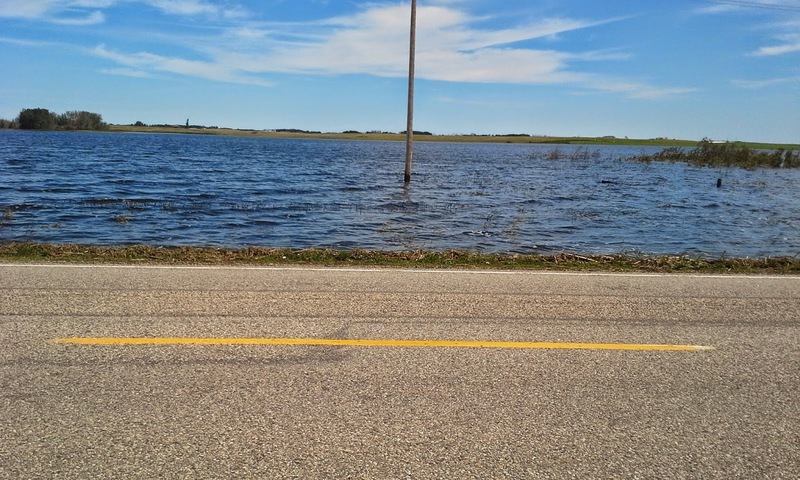 And if I made it to Melville, I could get to Highway 16 which was NOT closed, and get to Winnipeg. 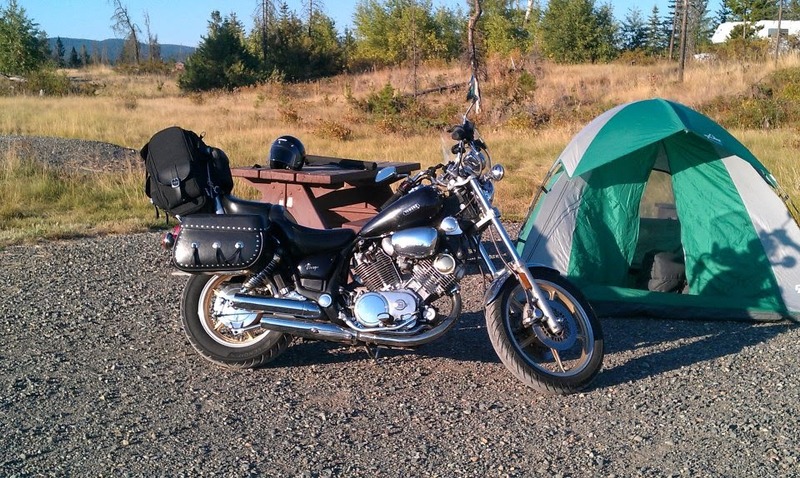 So, I packed up the scoot, said goodbye to my gracious hosts, and headed out. It didn't look TOO bad... maybe 6 inches tops, although it was running from left to right. I went slowly as far to the right as I dared... and got SOAKED! I was so concerned about the bike falling over, getting pushed by the current, going too fast, going too slow, that I forgot that the water would be splashed up onto my legs and even higher. But I made it through, and continued on with soaking wet jeans. This is now a lake. There are no crops here. The town of Hubbard was basically all under a few feet of water. Other places were running pumps, trying to dry out their homes. After another "water crossing" I made it to Melville. 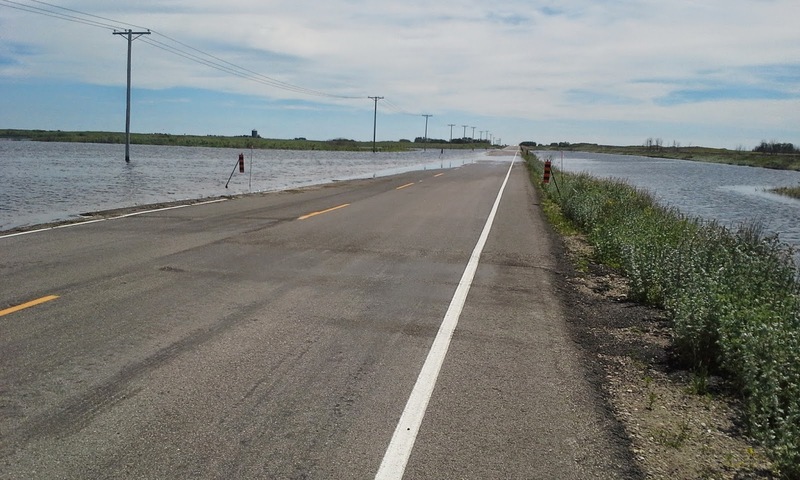 I was hoping to go south and get to Highway 1 after the closed section, but that road was covered with water as well. I reluctantly went East on Highway 15, since it had the dreaded warning. This time I put on the Plastic Party Pants so I wouldn't get quite so soaked. Several people stopped and asked if I was OK - Sask people are SO nice and friendly! I guess they were concerned after seeing the vehicle that didn't make it through - it was turned sideways with water up almost over the hood. But this time only my shoes and socks got soaked, and I continued on. But the Weather Gods weren't through with me yet. The wind picked up from the North so it was a crosswind. Stronger and stronger until it was 60-80 km/h. The bike was NOTICEABLY leaning into the wind, and crabbing down the road. Even the low-slung, heavy V-twin was being pushed all over the road. By Portage le Prairie I was almost ready to stop, but I pushed on the extra 90 kms until I got inside Winnipeg city limits. The first motel I stopped at didn't have a single room left, but mentioned another one just down the street. Sure enough, they had a single room for me (at a great price, until they added the 18% taxes!). Not fancy, but a bed, a TV, WiFi and a shower. I booked for 2 nights so I could spend tomorrow exploring Winnipeg.